Family Room – 090907 | emmy kay and co. 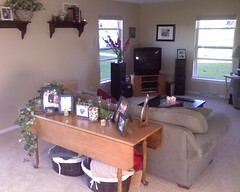 This is our family room, rearranged. I am going to hang some artwork (something bright) under the shelves. Still working on that. I think this lay out is a little bit more cozy since we have such a long family room. awwwwww, i miss this living room!!! well, i miss YOU living in this living room!!! seeing this brings back so many memories!!! i’m glad you are happy in IL with family and friends around you though!